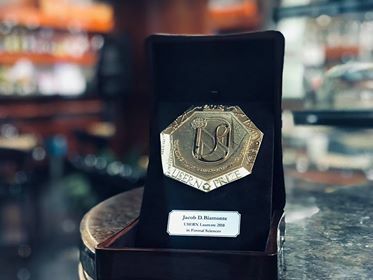 The 2018 Usern Prize Medal is now at Skoltech, thanks to Skoltech Professor and self-described quantum computer scientist Jacob Biamonte. In a special ceremony held in Reggio Calabria Italy, Biamonte has been named the 2018 Usern Prize Laureate in Formal Sciences. The Usern prize in Formal Sciences is awarded each year to “recipients in the top 1% of their fields who are under 40 years old” and have made a notable contribution to “Formal Sciences” which includes applied mathematics and the theory and foundations of logic and computation. The award includes a cash prize, the Usern Prize Medal and a trophy as well as honorary membership on the Usern advisory board for 3 years. Jacob Biamonte got the award for his extensive research in quantum computing. Professor Biamonte leads Skoltech’s Deep Quantum Labs which acts as the institutes hub for quantum enhanced simulator theory. Biamonte and his team have made a series of recent discoveries, including the development of novel algorithms to be run on future quantum enhanced processors – these future processors have been shown to accelerate the core calculations behind machine learning and drug discovery. Biamonte’s Deep Quantum Labs is one of Skoltech’s most open and vibrant research facilities; and among Skoltech’s most international teams – lab members hail from 8 different countries from around the world: including Italy, Chile, Thailand and even South Korea. Biamonte and his team collaborate with groups all around Moscow and the world. This award comes after a long list of accomplishments for Biamonte and his team in 2018. Not the least of which was giving half-a-dozen talks at top scientific venues in front of audiences of over 1000, winning several funding competitions and publishing a recent book in World Scientific. Biamonte received the official award in front of an audience 10 November in Reggio Calabria Italy. After receiving the award, he gave a public lecture on his research including recent problems he was able to solve, and problems he has been working on for over a decade.